- speaker type: sealed cabinet with serial capacitor. 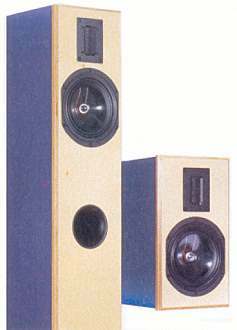 For the 25th anniversary of Hifi sound Bernd Timmermanns designed a couple of monitor speakers, both equipped with the Harwood UR 2.0 ribbon tweeter and the Harwood 18 WXP Cone bass drivers. The shelf speaker was designed as a sealed cabinet - high pass filter, fitted with a capacitor in series to the bass driver to enhance bass. The floorstander was equipped with a Helmholtz Absorber for suppressing cabinet resonance. ... "The exceptionally slim shelf speaker compensates for the lack of low bass with an outstandingly precise bass. The XL Monitor, on the other hand scores with a brilliant low bass volume. Mid and high frequencies of both monitors are alike as two peas in a pod. Recordings without significant bass really sound the same using both speakers. Impressive, above all, is the naturalness of vocals and their three dimensional representation. There is a certain tendency towards bass: the extreme like close range with many d'Appolito designs is not noticeable. The sound stage is rather deep, but that doesn't mean that there is no staggering – on the contrary: the staggering of vocals and instruments is excellent and in general, there is an magnificent easiness and airiness noticeable. And nothing changes, even at higher volumes: not least due to the relative high crossover frequency (3000 Hz compared to the 2000 Hz of the Monitor 17), monitor 18 and 18 XL show a considerable power handling. At the limit the small Monitor 18 is even one step ahead. The electrical high pass filter suppresses the lowest frequencies that just cause unwanted bass diaphragm excursion of the floorstander." If you prefer to mount the crossover components on a universal PCB instead on wood, we recommend a 140 x 102 universal PCB. Two PCB's per speaker are needed. If you want to use this speaker with a valve amp you'll need a impedance correction consisting of three components: 33 uF ELCO non etched, 0.33 mH air core coil and 6.8 Ohm resistor, 20 Watt: The high end version also employs standard components since high end components won't improve the sound (nevertheless, high end components for the impedance correction are available upon request).